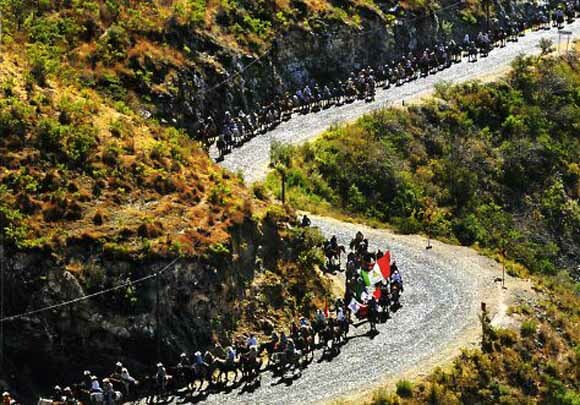 On Three Kings’ Day (January 6th) pilgrims from San Miguel de Allende will join thousands of other horseback riders to Cristo Rey (Christ the King). Christo Rey is the 65 foot statue of Christ atop a 8,500 foot mountain near the Leon airport that marks both the geographic center of Mexico, and a shrine to the martyrs of the 1927 Christero War in Mexico. It is to this statue that thousands of cowboys are riding, just as the three wise men rode to the manger in Bethlehem on this day over 2,000 years ago. The Three Kings rode to acknowledge the Kingship of Jesus, much like the pilgrim riders mark this day as feast for Christ the King. Pilgrimages are common in Mexico and abroad. But seldom is there such a massive cabalgata —a horseback gathering —of faith. Riders come from around the state and world. The procession of pilgrims on horseback ends at the foothill of the statue. 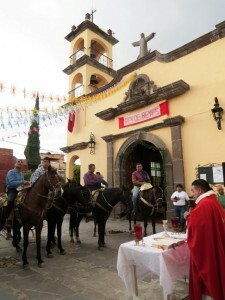 There, in a solemn ceremony, the riders receive a special blessing during an outdoor Mass. After the Mass, the pilgrim riders rest, put on clean clothes, and then ride up the mountain individually, or in small groups, to venerate the famous statue of Christ the King. Pictured are cowboys celebrating mass at the small Christ the King church in the Guadalupe neighborhood before beginning their pilgrimage.